Two interactive touchscreen kiosks with video and audio clips give visitors a glimpse into Jesse Owens’ life as told by Jesse Owens. One kiosk plays a Wheaties’ commercial featuring Owens and highlights Owens’ relationship with his Ohio State University mentor, Coach Snyder. Also visitors can hear from Owens as he recalls college track and the 1936 Olympics. A second kiosk plays an Adidas commercial featuring Owens and provides visitors an overview of Owens’ life including Owens speaking to youth and receiving the Roosevelt Award, the highest award given by the NCAA. 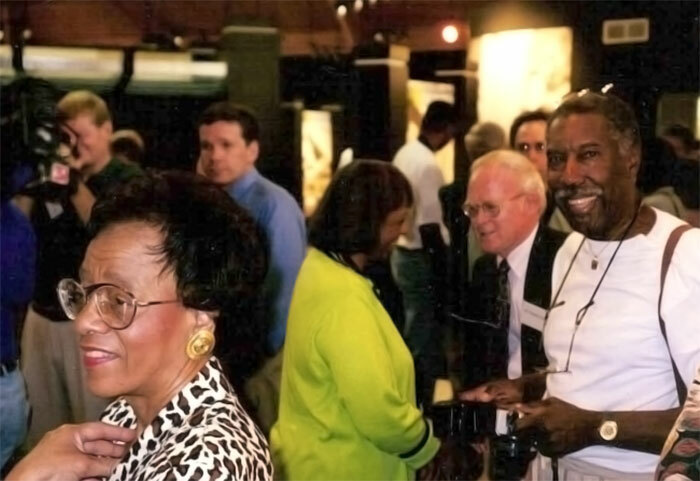 Beverly Owens Prather (left) being interviewed by The Birmingham News as Marlene Owens Rankin (center) and Malcolm Hemphill (right) enjoy the museum dedication. The Jesse Owens Memorial Park and Museum’s goal is to honor the life and accomplishments of this remarkable man, before and after the Olympics, and to educate the public of the legacy of his contributions to athletics and humankind, by depicting the moments that made Owens great and portraying the people in his life who shaped him as an athlete and as a person. The museum was dedicated on June 29, 1996 with the arrival of the Olympic torch on its journey to the Summer Games in Atlanta. Owens’ family was in attendance.